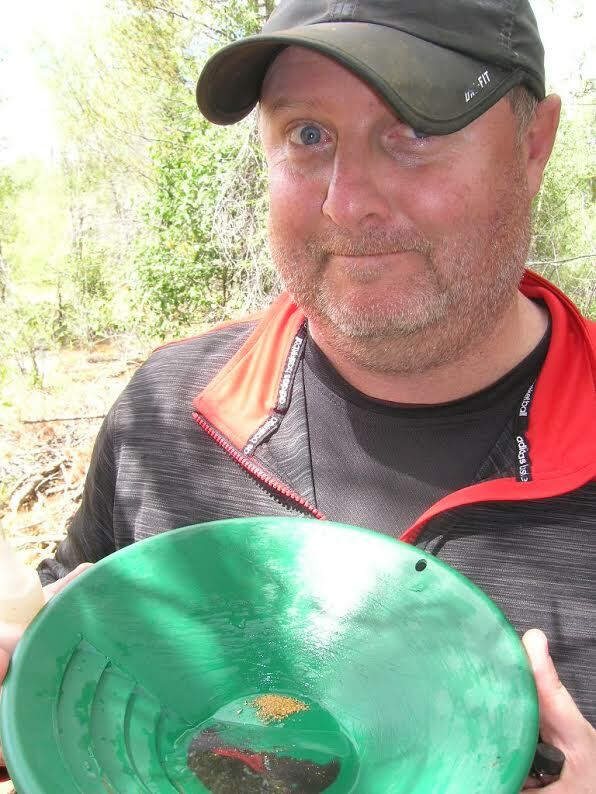 One of my favorite hobbies is getting out and doing a bit of gold prospecting. I have been to several locations around the United States hunting the beautiful stuff including North Carolina, South Dakota, New Mexico, Arizona and Colorado last year. The 2014 Colorado trip was only a couple of days on Cache Creek south of Leadville after a soccer tournament in Denver. This year I planned a bit more adventurous gold hunt to go along with the soccer trip. I was going into Denver a couple of days before the soccer tournament began to catch the MLS All Star Game that was being played at Dicks Sporting Goods Park. It also gave me the opportunity to get a little gold prospecting in during the day. I did some internet research and decided on trying my luck in the South Platte River just north of downtown Denver. The location was only about twenty miles from my hotel so I picked up my rental car and off I went. Westward on 70 and then northwest on 270. A little jaunt onto York Street and I was there. I had no idea what to expect and truthfully my expectations were pretty low. Boy was I about to get a surprise. To my luck there was a guy already set up sluicing when I climbed down the bank so I went over to get some local knowledge on the lay of the South Platte River and such. The man was quite friendly and willing to give advice to a Texan prospecting there on the blind. He basically told me the flood gold was plentiful down to about twelve inches in depth. Since I only had my pan and scoop with me I asked his advice on where to start grabbing some material. He pointed and off I went. I took time to read the river a bit and identified an area where it looked like gold would have a pretty good chance of falling out in higher water conditions. The water depth was only a couple of feet in the deepest areas so it was not tough going. I identified a couple of good sized rocks in about a foot of water and decided dig in behind them for my first pan. The black sand was visible as I loaded up my pan. I found a nice rock to sit on and started breaking down the material. Sure enough plenty of black sand, but was there color to be found? Heck yeah there was. As I planned it down I found a solid 7-8 colors. I did not work it all the way down instead putting the concentrates into a big ziplock bag. I would finish the work at home. I went back to the same spot and dug a little deeper for my next pan hoping for similar results. I was in the 2-4 inch zone I would guess. This pan was even better than the first pan with a good 12+ colors. I was quite impressed to say the least. This little South Platte River was giving up some gold. I was watching carefully over the next couple of pans as I went deeper into the material behind the big rocks. What I found was the flood gold seemed to drop off after the six inch depth contrary to what the local had told me earlier. At that point I decided to concentrate on the material from 1-5 inches in depth. I was able to spend about three hours on the South Platte River and knocked out ten pans on Wednesday. I estimated about a pan cycle every 17 minutes which included gathering the material, panning it down and bagging the concentrates. I would have a couple of hours on Thursday morning free so I planned to return. Having a day under my belt at the sight, Thursday I was smarter and more efficient. I knew better what to look for and at what depths the material was giving the best gold. I decided to head more into the middle of the river and find a new dig spot in a bit deeper water. I found a large rock at about two feet depth. Promising as I could see the black sand piled up behind it. I filled up a pan (it took a bit more effort filling at that depth) and headed over to see what I could pan out. After working it down I noticed something completely different from any of my pans from the day before. Pretty little red garnets were showing up in good numbers. Quite interesting! I guess nobody had worked that spot in awhile and the garnets had a chance to build up. And along with the garnets came gold. Plenty of gold! I counted easily 15 colors in the pan and I knew there was more in there as I didn't pan it all the way down. I bagged the cons and went back for more. I knocked out seven more pans before I had to leave, but every pan was showing colors in the double digits! Seventeen pans over five hours. I figured conservatively 12 colors per pan would yield 200+ pieces of nice South Platte River gold. Over the next few days I was in Denver as the group of 17yr olds I coach performed quite well at Denver Cup losing in the championship match to a team from Arizona. After collecting our awards I checked out of the hotel and headed three hours west for the next part of my gold adventure. Leadville was the destination and the plan was for a couple of days prospecting. Monday just north of the little town of Granite at Cache Creek and then Tuesday in the Arkansas River. I have a friend/fellow prospector that lives in Buena Vista so we met up early Monday morning and headed up to Cache Creek. After a solid little hike away from the common digging area I set up my Le Trap sluice and began feeding material. I ran fifteen buckets before doing my first clean out. We had done some sample pans and Randy was getting anywhere from 3-8 colors per pan. The first cleanup was really good. Easily half a gram plus from the fifteen buckets. We took a quick lunch break and got back at it knocking out another fourteen buckets of material. The second clean out once again produced over half a gram of chunky Cache Creek gold. One nice picker and another specimen where the gold was still attached to the host rock. The final tally I would estimate was about 1.25 grams and I had a good sized bag of concentrates to go through at home that I knew had another bit of gold in it. A very productive, yet tiring six hours at Cache Creek. After a yummy filet mignon dinner at Quincy's in Leadville I was ready to head back out on Tuesday. This time I was going into the Arkansas River to try my luck finding some river gold. Unfortunately the Arkansas River was still running a bit high so I was unable to set up my sluice. I would be stuck panning in the cold river. The area was a bit difficult and I just wasn't getting good color in any of my test pans at all. I tried ten pans in several different areas and never found more than one color in any single pan. I did get to see a good white water rafting crash that took a solid hour to clean up. Instead of such meager returns we opted to go explore the old silver mines above Leadville and had a wonderful time. Wednesday morning was for making the drive back to Denver to catch my evening flight home. The good thing was that there was a two hour window there to allow me back into Clear Creek just before the South Platte River in Denver. I was able to knock out twelve more pans there with good flood gold and garnets in every pan. I added the concentrates to my bag and went to the airport. I thought I might have an issue with security and I was right. It seems the guy at the x-ray machine did not like my plastic bag filled with gold and black sands. It became a major production with bomb testing and everything. Finally I showed them my vial with the Cache Creek gold and their moods changed. Through security and home to Texas. Another gold adventure in the books. Can't wait until next summer for another gold prospecting trip!